Next on The Scoop: Some of My Cats Love Affection, Some Don’t. What About Yours? They were tiny and starving little cats, struggling to survive on the streets. To make a long story short, I couldn't leave without them. In October 2005, I was on vacation in Barbados with my cousin Marie. Two days before our departure, as I walked past a frangipani tree, I spotted two small kittens on the walkway. Someone had put out milk for them in 95-degree heat. They were clearly starving. Some children from Great Britain filled me in. The kittens were abandoned and struggling to survive. I picked up the tiny brown tabby and said, “Just look at you — you tiny little miracle.” That night there was a fierce thunderstorm. In the morning, I rushed to find the kittens. Some children told me they last saw the brown tabby following the orange tabby, drenched and very weak. I felt bad, but was sure there was no way I could take them to the U.S. A very nice British man reminded me you don’t know unless you try. I found the little orange one and searched all day into night for the smaller one. I cringed walking along the road. Meanwhile, I called American Airlines and paid for a pet to fly in the cabin with me. I took the kitten to the Agriculture Department for permission and to a vet for health clearance. I discovered she was a little girl! 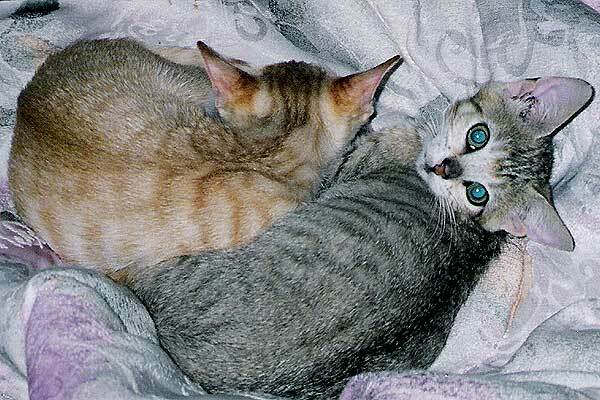 That night, Marie named the kitty Pangi, for the frangipani tree. We made a litter box with sand and she jumped in. There was a knock at the door. The children had found the other kitten! Our last day on the island was spent repeating the routine from the day before, and picking up a carrier. We were convinced we had a boy and were naming him Larry for St. Lawrence Gap, the local neighborhood. She became Lawri, instead. Five hours later we arrived in Miami with very little time to make the flight for Washington, D.C. The customs agent said, “What’s in the box?” Scared, I said, “Two little kittens.” He pointed to a long hall and told me to go that way. Sure we would miss our flight, I began walking very fast. To my left was a glass door with people rushing by. I went through the door, certain that alarms would screech. I would be arrested and the kittens taken away. As I hurried through the baggage screening, they peeked in the box and noted I was about to miss the flight. A very nice man in uniform took me through construction behind the scenes to the gate. Five minutes later, as the plane took off, I cried happy tears. We were going home! They may be illegal aliens, but we made it. The next day my vet checked the girls. Pangi weighed 7 ounces and Lawri only 4 ounces. He wasn’t sure she would live, but she did. Pangi has always been the leader and is worshipped by Lawri. They are loving sisters, very cuddly, big on kissing faces. They love strangers. Today, they each weigh seven and a half pounds. 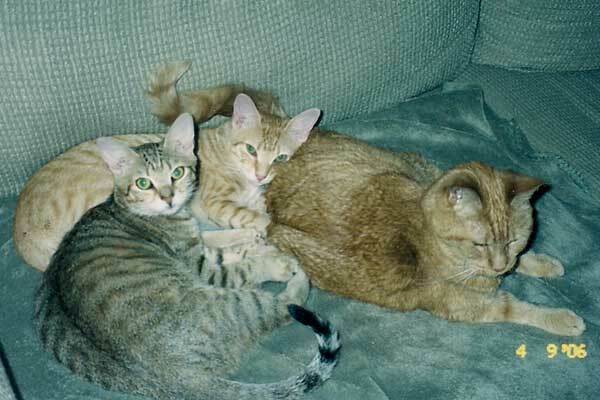 At the time we brought them home, we already had a cat, four dogs, a dozen parrots, two chinchillas, and a rat named Minnie, who we found as a baby in a parking lot. We adopted Muffin, our cat, from the Humane Society in 1990. She was rare in that she loved birds, dogs, and Minnie the rat. Lawri tried to get up close to the cage of Pearl, our parrot. Pearl came closer and said, “What’s the matter with you?” and Lawri flipped out. Neither of the cats wants to tangle with a talking bird who had a beak. Shortly after we came home, my beloved Muffin, who was never sick, was diagnosed with fibrosarcoma in the right hind leg. She was nearly 17 years old. We made the decision not to amputate. We made her comfortable, and the kittens took over grooming her. I had her company for six more months. 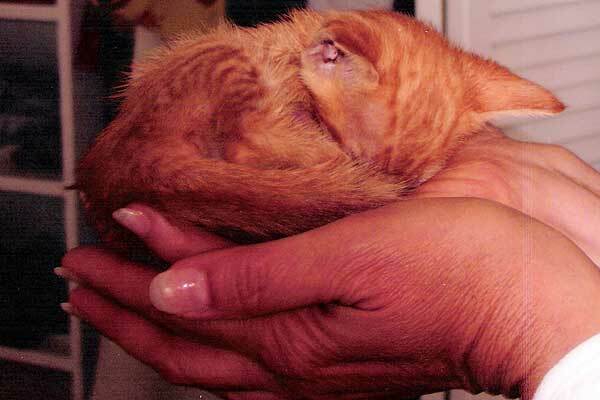 She was an orange tabby like Pangi. 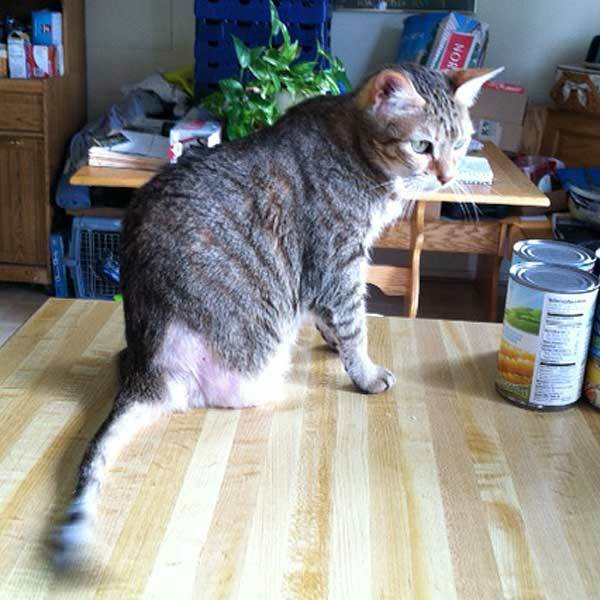 Five years later, Lawri was diagnosed with fibrosarcoma in her right hind leg. It’s been 18 months since the amputation, and no recurrence. I sometimes wonder how two of my cats, so different and born so far apart in distance and years, would have the same disease. It’s happens to one in ten thousand cats. Yes, they are and were one in a million cats. My island girls are precious and rare, just like Muffin. I’m blessed to have found them. Rosary Bovello is the owner of Gaithersburg Pet Sitting in Montgomery County, Maryland. She shares her home with her husband, granddaughter, granddog Oliver (who loves the cats), grandhorse Samantha the Arabian mare, Pearl the African Grey parrot, and of course Pangi and Lawri.